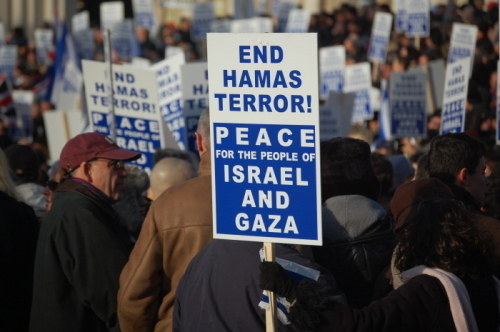 For Israel, For Peace, For the innocent of Gaza, Against Hamas Terror. Jewish and Christian demonstrators rally in Trafalgar Square, London on January 11th. Rabbi Jonathan Sacks - Chief Rabbi. Demonstrations permeated down to a local level in many cities around the U.K. These demonstrations made it to local newspapers and reinforced ill-informed public opinion against Israel at a local level. But there are deeper concerns to be considered about the demonstrations. How are our nations standing up to Islamic intimidation? Whilst wildolive in no way sympathises with the BNP, or any fascist group, this video posted on BNPTube poses questions that need answering - urgently! See the Metropolitan Police in London being subjected to violent confrontation from "Free Palestine" demonstrators! The media did not appear to find this worthy of comment. Warning - the language is offensive. And worldwide, the demonstrations were all violently anti-Semitic. Two Zombietime blogs captured the picture.